I haven’t done Stitch Fix lately, but when I saw I had some credit AND they waived the styling fee for one fix, I decided it was time to see what they had for summer. Wow, am I glad! They sent me such fun things! Since summer is coming, and I’m not feeling especially svelte right now, I requested cool loose summer styles and they did a great job finding things that I like and that feel like thinhttp://owlhaven.net/wp-admin/post.php?post=26916&action=editgs I would really wear. Item # 1 is the Janet Bermuda Short by Liverpool. 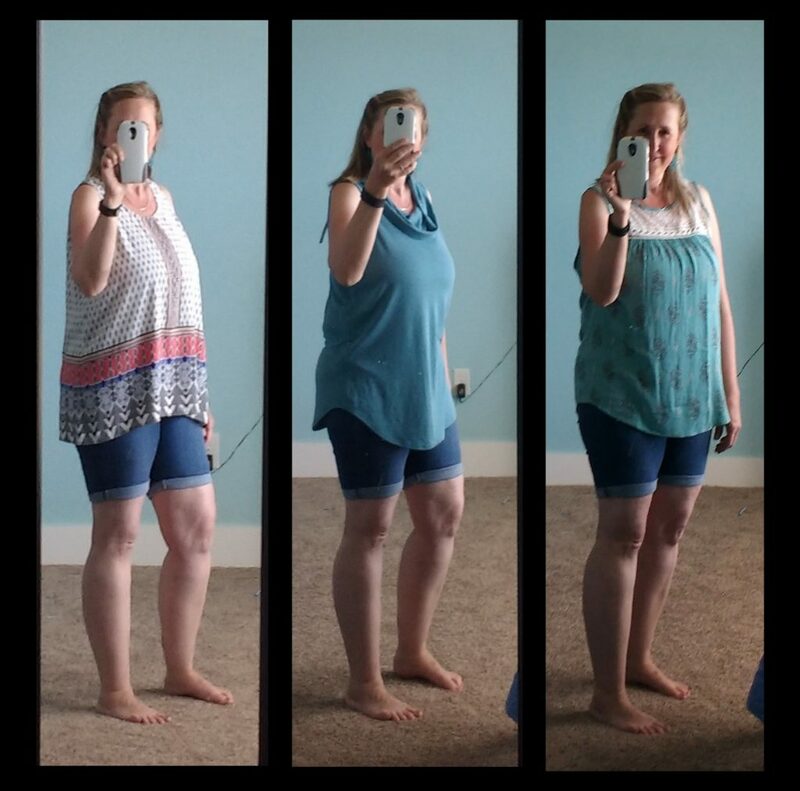 It is a stretchy pair of denim shorts (shown in all three photos) that I could picture myself wearing tons this summer.The denim has Lycra, and the shorts have a soft wide waistband. Super, super comfy. And of course denim is as versatile and practical as you can get. I am strongly leaning toward keeping these. Actually, I’m wearing them right this second. Item #2 is the Fun2Fun Clybourn Scoop Neck Top, on the left in the photo collage below. Loose and comfy, I really liked this top. The armholes are a little deep. But Stitch Fix now has a deal where you can exchange clothing for different sizes (when available) and I am considering requesting a smaller size to see if it addresses the armhole problem. I also wouldn’t mind if it were just a bit less big in the tummy area. Item #3 is the LeLis Yeaton Cowl Neck Knit Top. It is one of my favorite colors and is I think reasonably flattering. It is also made is a very soft silky knit. The cowl makes the neckline just a little fiddly, and there is also a fairly large vee in the back that I am not super sure about. But I think this top would be nice for summer, and for fall and winter layered under a jacket or cardigan. It is definitely classy looking enough that you could really dress it up if you wanted to. Item #4 is the Jella C Lace Bib Top. It is possibly my favorite top in the batch, as is is feminine and (again) a favorite color for me, and feels more dressed up than a tee while still being very comfy. It does again have some armhole issues, and is NOT available in any other size. But I think I could do 10 minutes of tweaking/tailoring on the sewing machine and make it absolutely perfect. The fifth item was the Shiraleah Porter Tote, a soft leather bag in taupe. I don’t truly feel like I need another bag, so I am leaning toward returning it. But as usual, there’s a 25% discount if you buy all five items. So if I do decide to keep the other four things it makes zero money sense to return the bag. What do you think I should keep? If I kept only two things it would probably be #4 and #1 …but I honestly like #2 and #3 quite well also. The shorts and cowl neck top are great choices for the reasons you already gave. Have a great summer Mrs. Mary! I love the shorts and the cowl. The other shirts are very cute too, but the cowl is super flattering, Mary! Well, I opened it up and as usual for Stitch Fix posts, I looked at the photos before reading anything in order to have unbiased initial impressions. I immediately said Shirt #3 (item 4 in your list) was my favorite; Shirt #2 was also pretty, was flattering on you, and would be easy to dress up or down. Probably because of the type of fabric it is, it drapes closer to your body so looks a little more slimming. Since you were doing selfies to model, we obviously can’t see either backside vees or armhole issues to know how annoying they would be. I think Shirt #1 does nothing for you, either color or style. If you love the shorts that much, you’ll get your money’s worth out of them. I agree with Sandi – that cowl neck looks fabulous on you, the shorts seem like a no brainer and I’m not keen on the other two tops – just my opinion. I love item #2 🙂 and i do think it is flattering. So yup. You’ll have to decide for yourself 🙂 . I love the scoop neck top! And yes, you could wear a size smaller. I think it would look very good on you? I think item #2 is more flattering than item #4. Item #2 seems unique and summery. It’s pretty. Inquiring minds want to know… what did you decide? So I decided to keep the shorts and both of the blue tops. Thanks for all the advice, everyone!